I stumbled across a new (well, new to me at any rate!) spirit today from Greece. I was looking through the brandy section at BevMo to pick up something to make sangria this weekend and found that my old standby, Torres 10 (which is a lovely brandy for mixing), was out of stock! Against my better judgement I asked one of the employees for a recommendation. After telling him that I was a fan of the Torres he steered me to the Metaxa 7 as a replacement brandy. My lunch was nearing it's end so I grabbed a bottle and back off to work! I always love to experience a new wine or spirit (that is my favorite part of drinking, the adventure!) and when I arrived home I cracked it open for a smell. Rose, vanilla, grapes, herbs... rather odd for a brandy I think, but very nice nose. Now, after some google searches I found that the entire Metaxa line is not really brandy at all, but a special blend of traditional brandy, wine, rose petals, spices, and herbs. Instant fail, BevMo! I really should know by now not to trust your employees for accurate recommendations (there are a few diamonds in the rough, though). The one redeeming facet of this is that the Metaxa is actually pretty damn good! I first tried a splash on the rocks to get a feel for the spirit, and I'm not sure if it was just the hot day or it's Mediterranean origin but it was screaming to be made into something light and refreshing. This should be your first key that this not an ordinary brandy as 'refreshing' is not usually the first thing that comes to mind with the spirit. What to do with it now? Instantly I thought of the Q tonic water I have in the fridge (Fever Tree is my favorite, but I was experimenting with Q recently) and the remainder of the orange from the Negroni I made earlier. This was seeming too much like a standard tonic/spirit drink... lets mix it up with some St. Germain! As the jingle goes, "St. Germain makes everything better!" (for the uninitiated, St. Germain is an Elderflower liqueur from the French Alps). I'm sure there are a lot of other, more refined mixed drinks featuring Metaxa 7, but after a hot day this rocks. Stir Metaxa and St. Germain with ice, strain into ice filled white wine glass. Top with tonic, stir gently. Garnish with orange slice. I know that I have been very lax with posting... well, not posting at all really. I could blame work (I am a professional photographer and the studio has been truly crazy this summer), blame my personal life, blame etc. but I won't. In reality I just dropped the ball. On the upside I am now picking that ball back up. I begin not with a wine review but with a mixed drink review! In my absence I have discovered the beauty of the classic mixed drink and am set out to share that (as well as the beauty of wine) with all who will listen. What spurred this new direction (well, I prefer to think of it as a diversification!)? Most notably is the fact that the Guild of Master Sommeliers tests on basic mixed drink knowledge and that I have begun reading the James Bond Novels by Ian Flemming. For those of you in-the-know Mr. Bond is rarely found without a cocktail or mixed drink by his side (more on the disctinction between the two later!). At any rate I will hopefully, with time, become both your wine and cocktail hero. Enough rambling, if you have made it this far I truly commend you. Let's celebrate together with an amazing long drink! A long drink is a mixed drink with large volume, usually served in a highball glass with a large amount of ice. This makes long drinks in general fairly refreshing and particularly well suited to the heat of summer. Today's long drink is a variation of the Gin & Tonic called the Gin & French. Essentially it is a Gin & Tonic with the addition of dry vermouth. Add gin and vermouth to an ice filled highball glass, stir to chill. Top with tonic and gently stir to mix. Garnish with lemon peel and mint. These are the ingredients that I use but feel free to experiment. Quality ingredients are very important for a quality drink. I must say that the Fever Tree tonic is a revelation! I read recently that using a high quality tonic will greatly elevate any drink it encounters and made this drink as a test drive. It is so good that I could drink this stuff straight all day long. Not even in the same camp as generic tonic water or that swill they serve from a soda gun in bars. In the spirit of the Gin & French - Viva La Fever Tree! After long procastination I am finally getting this blog rolling - and with a beautiful wine to begin with! I am always on the lookout for new wines to try and out of the way regions to discover. Through this I have come across and become fascinated by the Etna D.O.C. in Sicily, Italy. The Etna DOC runs along the northern and eastern slopes of Mt Etna and the dominant grapes in the region are the bigger Nerello Mascalese followed by a fleshier and more subtle Nerello Cappuccio. The Nerello varietals are thought to be descendants of Sangiovese. The soils throughout the region are predominantly volcanic mixed with some sandy soil and are high draining. This small region of Sicily is one of the few places in the world where grapevines are cultivated on the slopes of an active volcano. The Petra Lava Rosato is a beautiful rose. This appears vibrantly strawberry red when poured in the glass but is in all actuality more of a pale strawberry/salmon when viewed over a white surface. When first opened it exhibits lots of fresh cranberry, cherry, and floral notes followed by rocky (I swear volcanic) earth. After being open for a couple hours the fruit mellows a bit and gives way to some more nuanced strawberry, herbal (think hint of basil), and rose petal flavors. 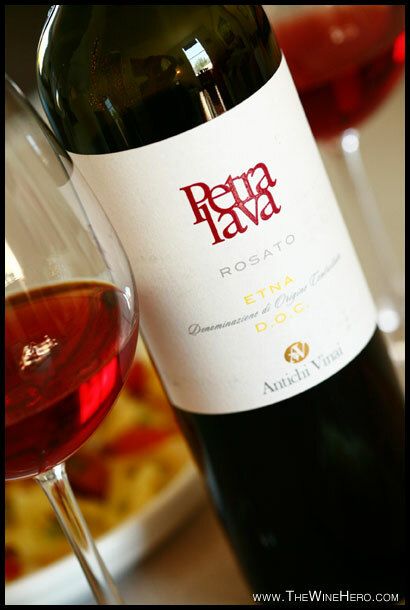 The medium plus acidity and just hint of tannin keeps the Petra Lava vibrantly fresh and begs for food. Today we paired it with my favorite pasta dish, baby heirloom tomatoes sauteed with olive oil and garlic over spinach tortellini and topped with fresh basil and Grana Padano (young Parmesan). It was a beautiful pairing as the acidity in the wine was a nice compliment to the tomatoes and the dish relies on it's freshness as does this wine. Best lunch I have had in ages! Strawberry/salmon color. Fresh cranberry, cherry, and floral notes followed by rocky volcanic earth. After decant the fruit mellows a bit and gives way to strawberry, herbal (basil), and rose petal. Medium plus acidity and just hint of tannin. Excellent Balance and medium to medium plus complexity with a medium finish. 13% abv. Highly recommended. $14.99 on closeout from K&L, regularly $19.99.